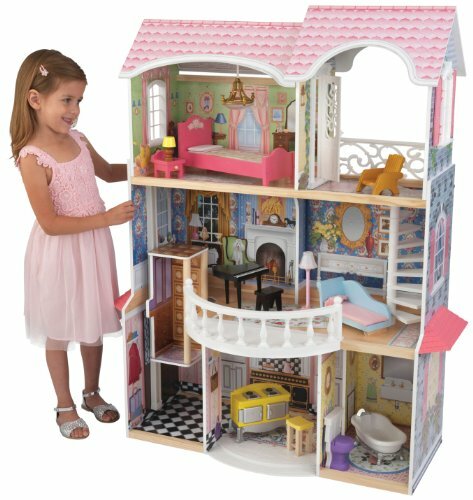 Barbie or any other fashion doll would be more than satisfied to call the KidKraft Magnolia Toy Dollhouse ”home”. This 3-story dollhouse is designed for fashion dolls up to 12 inches in height and it’s loaded with details and features children will adore exploring. For one thing, dolls will access the second floor via elevator and the third floor via a super slick spiral staircase. The second floor features a half-round balcony while the third floor features a terrace complete with a comfy patio chair for taking in the fresh air. There are even real working shutters on some windows. Each room is elaborately detailed with special flooring and background images. Kids will have fun taking in the fancy drapes, ornate mirrors, fireplaces, and artwork that decorate the back walls. As far as three dimensional furnishings, this house is fully furnished. The kitchen offers an old fashioned stove and a stool while the bathroom has a claw foot tub and a toilet that makes real flushing sounds at the press of a button! Upstairs, kids will find a glamorous chaise lounge, a table lamp that really lights and a grand piano that plays music when the button is pushed. There’s also a piano stool. The third floor bedroom includes a bed, nightstand, and table lamp. About KidKraft KidKraft is a leading creator, manufacturer, and distributor of children’s furniture, toy, gift and room accessory items. KidKraft’s headquarters in Dallas, Texas, serves as the nerve center for the company’s design, operations and distribution networks. With the company mission emphasizing quality, design, dependability and competitive pricing, KidKraft has consistently experienced double-digit growth. It’s a name parents can trust for high-quality, safe, innovative children’s toys and furniture. 3-story dollhouse features an elevator and a spiral staircase. Suitable for use with fashion dolls up to 12 in. tall. Includes 13 accessory pieces for fully furnished rooms.